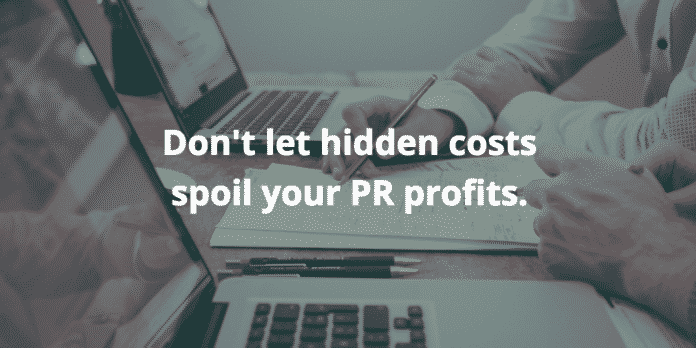 This means that your budget will need to attempt to gauge the press release cadence. It’s not going to be 100% accurate all the time — but very few budgets are. Ultimately, though, you should also build in a “fudge factor” or cushion into your travel budget. Add an extra 10% or 15% (or more) to cover unexpected trips or higher-than-anticipated room rates or airfares. The project budget should, however, include the cost of managing the advertising — both in terms of staff cost as well as any third party vendors or tools used to implement the campaigns. Common methods include allocating based on headcount or revenue. In other words, if 3 FTE’s in an agency of 15 people work on a project, it would be charged 20% of G&A using a headcount model. If that same project had revenue of $100,000 on total annual firm revenue of $1,000,000, it would be charged 10% of G&A using a revenue model.